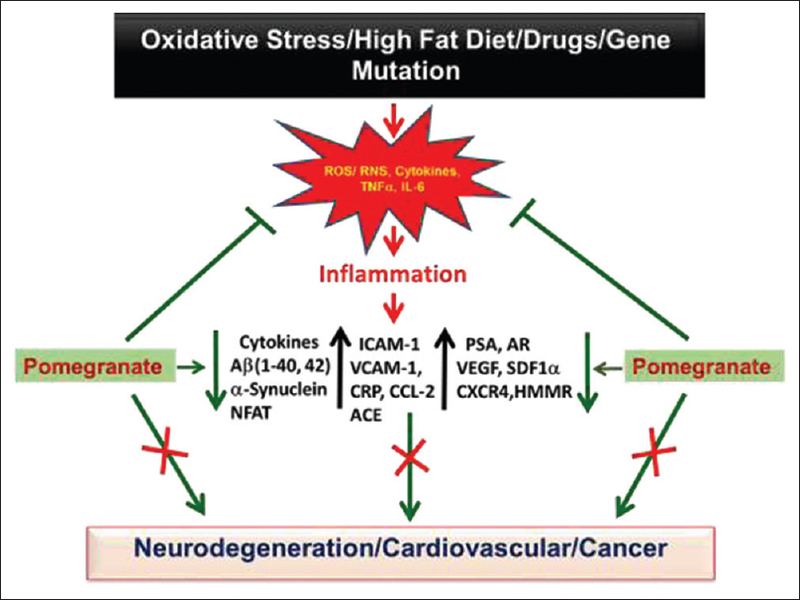 Neurodegenerative diseases, particularly mediated through increased nitroxidative stress and inflammatory cytokines, are considered to be a greatest medical challenge even for the poorly-developed world. The un-predictable onset of neurodegeneration can lead to devastating illnesses, such as Alzheimer's disease (AD), Parkinson's disease (PD), Amyotrophic Lateral Sclerosis (ALS) and other types of dementia. Extensive research has shown that inflammatory cytokines and mitochondrial dysfunction can promote neurodegeneration, resulting in accumulation of Ab peptides in the case of Alzheimer's disease or progressive loss of dopaminergic neurons by a-synuclein mutation in the nigrostrial system in Parkinson's disease. In addition, cardiovascular disorders are among the leading causes of death and disability in the world. For instance, hypertension is a major risk factor for cardiovascular and cerebrovascular disease, end stage renal disease, type 2 diabetes, and metabolic syndrome. Similarly, cancers in many tissues including lung, breast, prostate and blood are leading causes of mortality all over the world. In addition to changes in gene expression and genetic mutations, environmental factors, drugs and dietary habits of individuals may play an important role in the onset of these neurological conditions. In the search for effective treatment and cure, the focus has recently shifted from allopathic western medicine to alternative and complementary medicine in many countries (including the United States of America). In fact, some dietary supplements including herbs, vegetables, nuts and fruits, have demonstrated promising outcomes in improving human health. Among them, pomegranate; is one of the exotic fruits that has been known for its valuable effects from the time immemorial. Pomegranate (Punica granatum), one of the oldest known fruits, belongs to the family Lythraceae. It is believed to have originated in Persia and have several varieties. At present pomegranates are grown in many Middle Eastern, Asian, European and other western countries, including the United States of America. Pomegranates have been used for thousands of years in treating a wide variety of diseases in the ancient times and currently used to treat many complications, including; pregnancy, coronary heart disease, atherosclerosis, prostate cancer and male infertility. The beneficial effects of pomegranate have been revealed in the writings of many cultures and religions, since they were grown in abundance in all ancient civilizations. Pomegranates have been appreciated for their beautiful color and flavor, and health benefits from the ancient times. The edible juicy ruby red arils are full of antioxidants and are considered healthiest part of the fruit. Fortunately, the century-old description of the pomegranate as a healthy fruit among all others still holds its integrity due to the presence of high content of antioxidants, vitamins B6 and C, minerals, and fiber. The antioxidant activities of the polyphenols (e.g., ellagitannins, ellagic acid, gallic acid, granatin A and B, punicacortein A, B, C and D, punicafolin, punigluconin, and punicalagin) are specifically responsible for the beneficial effects. So, the protective effects of pomegranates can be demonstrated for many neurological, cardiovascular, metabolic, and oncological diseases. In fact, the beneficial effects of pomegranates (www.clinicaltrial.gov, last accessed on 2015 Jun 10) are recently being evaluated against prostate and colorectal cancers, antiaging, memory loss and cardiovascular, renal and pregnancy complications. Interestingly, out of 59 clinical trials that are being conducted across the world, 31 are taking place in the USA alone followed by the Middle Eastern countries (14), Israel (10), Iran (3), and Turkey (1). The beneficial effects of the pomegranate were studied extensively and are under different phases of clinical trials. For instance, dietary supplementation with pomegranate juice resulted in a markedly decreased brain tissue loss in the brain regions (cortex, hippocampus, and striatum) by inhibiting caspase-3 activation. In addition, ellagic acid, a polyphenolic component in pomegranate juice, was shown to appear in the plasma and exhibit the neuroprotective effect on neonatal brains. Long-term supplementation (15 months) with 4% pomegranate was shown to attenuate the AD-like pathology by inhibiting oxidative damage and decreasing the amounts of lipid peroxides and protein carbonyls. Additionally, it restored the antioxidant enzymes superoxide dismutase (SOD), catalase, glutathione peroxidase (GPx), and glutathione S-transferase (GST) as well as glutathione (GSH) levels in the AD mouse model, as shown in [Figure 1]., Recently, Braidy et al., also demonstrated that the pomegranate juice extract can ameliorate 1-methyl-4-phenyl-1, 2, 3, 6-tetrahydropyridine (MPTP) -induced neurotoxicity in human primary neurons by attenuating redox imbalance to a greater extent and slowing down age-related neurodegeneration. Although there are no proven methods to delay the onset or slow down the progression of AD, PD, and ALS, recent studies suggest that dietary interventions can alleviate the risk of neurodegeneration. Compared to other fruits and vegetables, pomegranates contain very high levels of polyphenolic substances, and have been shown to influence the behavior in a transgenic mouse model (APPsw/Tg2576). Pomegranate juice-treated mice learned water maze tasks more quickly and swam faster than controls and had less accumulation of soluble Aβ42 and amyloid deposition in the hippocampus. Male amyloid precursor protein/presenilin 1 (APP/PS1) transgenic mice, when supplementation with pomegranate extract (6.25 mL/L) for 3 months significantly improved the memory function of the male transgenic mice containing amyloid precursor protein/presenilin (APP/PS1), when determined by the Barnes maze testing. In addition, the brains of the pomegranate-fed mice had lower levels of tumor necrosis factor α (TNFα) with decreased transcriptional activity of nuclear factor of activated T-cells (NFAT). Cell culture experiments also demonstrated the beneficial effects of punicalagin and ellagic acid by attenuating NFAT activity in a reporter cell line. These polyphenol compounds decreased Aβ-stimulated TNF-α secretion from murine microglia, inhibited microgliosis, and attenuated AD progression. The adipose tissues in obese subjects contain a higher level of inflamed macrophages than the adipose tissues in normal individuals and secrete proinflammatory molecules that promote the systemic inflammation, leading to metabolic complications. Chemokine ligand 2 (CCL2), secreted from hypertrophied adipocytes, can attract and activate macrophages in the adipose tissues that in turn secrete TNFα and other proinflammatory molecules. The pomegranate husk extract and its phenolic constituents, punicalagin and ellagic acid, have exhibited an anti-inflammatory effect in vitro co-culture system of 3T3-L1 murine adipocytes and RAW 264.7 macrophages. Punicalagin and ellagic acid decreased TNFα and CCL2 macrophage secretion and reduced interlukin 6 (IL6) expression and secretion by adipocytes. Pomegranates in addition to possessing antioxidant and anti-inflammatory properties, possess additional biological activities such as the inhibition of angiotensin converting enzyme (ACE). Natural pomegranate juice (150 mL/day) following a 12 h fasting showed hypotensive properties as determined by the systolic blood pressure (SBP), diastolic blood pressure (DBP), and flow-mediated dilation (FMD). Serum concentrations of C-reactive protein (CRP), intracellular adhesion molecule-1 (ICAM-1), vascular cell adhesion molecule 1 (VCAM-1), E-selectin, and interleukin-6 (IL6) were also altered. Although consumption of dietary supplements containing pomegranate extract (POMx) by arthritis patients is on the rise, the efficacy of such preparations in suppressing joint inflammation and damage is not known. However, POMx potently delayed the onset and reduced the incidence of collagen-induced arthritis (CIA) in mice by decreasing IL6 in the joints of POMx-fed mice and prevented bone and cartilage destruction. In conclusion, many studies, both in animal models and humans, demonstrated the pomegranate as one of the most powerful fruits enriched with high antioxidants and minerals and vitamins. The fruit also helps to prevent or treat many pathophysiological conditions without any side effect. In general, dietary supplements, fruits, and nuts are considered safe. Nevertheless, the basic and clinical outcomes clearly showed a direct correlation between pomegranate compounds and their therapeutic potential on neurological syndromes, cardiovascular syndromes, cancers, and metabolic syndromes. The financial support from The Research Council, Oman (RC/AGR/FOOD/11/01) is highly acknowledged. Loren DJ, Seeram NP, Schulman RN, Holtzman DM. Maternal dietary supplementation with pomegranate juice is neuroprotective in an animal model of neonatal hypoxic-ischemic brain injury. Pediatr Res 2005;57:858-64. Subash S, Essa MM, Al-Asmi A, Al-Adawi S, Vaishnav R, Braidy N, et al. Pomegranate from Oman Alleviates the brain oxidative damage in transgenic mouse model of Alzheimer's disease. J Tradit Complement Med 2014;4:232-8. Essa MM, Subash S, Akbar M, Al-Adawi S, Guillemin GJ. Long-term dietary supplementation of pomegranates, figs and dates alleviate neuroinflammation in a transgenic mouse model of Alzheimer's disease. PLoS One 2015;10:e0120964. Braidy N, Selvaraju S, Essa MM, Vaishnav R, Al-Adawi S, Al-Asmi A, et al. Neuroprotective effects of a variety of Pomegranate Juice extracts against MPTP-induced cytotoxicity and oxidative stress in human primary neurons. Oxid Med Cell Longev 2013;2013:685909. Hartman RE, Shah A, Fagan AM, Schwetye KE, Parsadanian M, Schulman RN, et al. Pomegranate juice decreases amyloid load and improves behavior in a mouse model of Alzheimer's disease. Neurobiol Dis 2006;24:506-15. Rojanathammanee L, Puig KL, Combs CK. Pomegranate polyphenols and extract inhibit nuclear factor of activated T-cell activity and microglial activation in vitro and in a transgenic mouse model of Alzheimer disease. J Nutr 2013;143:597-605. Winand J, Schneider YJ. The anti-inflammatory effect of a pomegranate husk extract on inflamed adipocytes and macrophages cultivated independently, but not on the inflammatory vicious cycle between adipocytes and macrophages. Food Funct 2014;5:310-8. Asgary S, Sahebkar A, Afshani MR, Keshvari M, Haghjooyjavanmard S, Rafieian-Kopaei M. Clinical evaluation of blood pressure lowering, endothelial function improving, hypolipidemic and anti-inflammatory effects of pomegranate juice in hypertensive subjects. Phytother Res 2014;28:193-9. Shukla M, Gupta K, Rasheed Z, Khan KA, Haqqi TM. Consumption of hydrolyzable tannins-rich pomegranate extract suppresses inflammation and joint damage in rheumatoid arthritis. Nutrition 2008;24:733-43. Gasmi J, Sanderson JT. Growth inhibitory, antiandrogenic, and pro-apoptotic effects of punicic acid in LNCaP human prostate cancer cells. J Agric Food Chem 2010;58:12149-56. Hong MY, Seeram NP, Heber D. Pomegranate polyphenols down-regulate expression of androgen-synthesizing genes in human prostate cancer cells overexpressing the androgen receptor. J Nutr Biochem 2008;19:848-55. Kasimsetty SG, Bialonska D, Reddy MK, Thornton C, Willett KL, Ferreira D. Effects of pomegranate chemical constituents/intestinal microbial metabolites on CYP1B1 in 22Rv1 prostate cancer cells. J Agric Food Chem 2009;57:10636-44.